These activities were created for my own classroom to use as a supplement with a basal reading series. As a teacher, these are the activities that I personally needed to effectively teach the skills included in each week of the basal series. 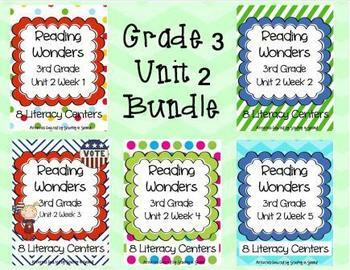 This product includes activities to be used in stations/centers and whole group lessons. This product is not meant to be used on its own, but side-by-side with the basal series as a supplement and to reinforce the skills that are outlined in the basal series. If you have any questions, please feel free to ask. This includes all 5 weeks of my Grade 3, Unit 2 packets.